According to the Humane Society of the United States (HSUS), there are approximately 3,500 animal rescue shelters in operation in the United States today. These facilities and the hardworking staff and devoted volunteers who work for them serve anywhere between 6 and 8 million animals every year, providing housing, food, medical attention, and perhaps most importantly of all, love, to dogs, cats, and critters who are in desperate need. 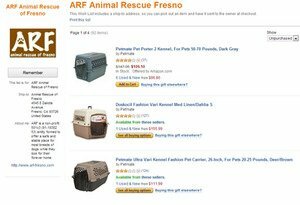 One way to help a local shelter of rescue is to donate an item off its online retail wish list, such as Amazon. But with a seemingly endless supply of homeless pets coming through their doors each day and a limited number of financial resources at their disposal, many shelters are struggling. That’s why, starting in 1996 and inspired by the Capitol Humane Society in Lincoln, Neb., the HSUS established National Animal Shelter and Rescue Appreciation Week, a time for shelters to reach out to the communities they serve and for the public to get involved in helping their local shelters and animal rescues. This year, National Animal Shelter and Rescue Appreciation Week will be held from November 3 through November 9. Shelters across the country are celebrating this important week-long event in different ways. At the San Luis Obispo County Animal Services Shelter in San Luis Obispo, Calif., shelter supervisor Andrea Liddie will commemorate National Animal Shelter and Rescue Appreciation Week by raising awareness in a way only few have done before — she will spend a full 24 hours, from 11:00 a.m. Wednesday to 11 a.m. Thursday, among the dogs she cares for each day, living and sleeping right beside Bubby, a small dog at the shelter who is in desperate need of a home. “One-year-old Bubby was shell-shocked when she arrived at the shelter,” San Luis Obispo County Animal Services Shelter volunteer Ellen Perryess tells SanLuisObispo.com of the little pooch who will be Liddie’s bunkmate come Wednesday evening. “She didn’t know whom or what to trust. Fortunately, Bubby, like so many little dogs, was born to love and be loved,” Perryess adds. A dedicated group of volunteers who specialize in rehabilitating small dogs has been working with the timid Bubby, and apparently their efforts are really paying off. “Thanks to these lapdog trainers, Bubby is longing to find a human companion to focus all her love and devotion on,” Perryess explains. Liddie hopes to draw some much-needed attention to the plight of shelter dogs like Bubby during her shelter stay, perhaps even helping some of these worthy pets a good home by the end of the week. Before she settles down into her kennel for the night, she plans to collect donations of fleece blankets, canned cat food, and financial donations from other local animal lovers. On the other side of the country, in Jefferson County, N.Y., the local animal control shelter held a successful open house event to kick off National Animal Shelter and Rescue Appreciation Week. Shelter supervisor Todd Cummings tells YNN that nearly 200 people were in attendance during the November 3 afternoon event. Nine dogs found wonderful families in the first hour of the open house, something that made all the staff’s efforts completely worth it. According to Cummings, 2013 has been the year of the little dog at his shelter. Of the 22 pets who were up for adoption during the open house event, 10 were small dogs under 15 pounds. “That has never happened before,” Cummings, a 30-year veteran at the animal control shelter, tells the Watertown Daily Times of the small dog influx at his facility. Seek out a nearby shelter and ask them about their donation wish list. Many rescues will have these item lists posted on their websites, but you can also call or visit to inquire about what necessary resources are in short supply. By holding a donation drive in your neighborhood or by rounding up some of these wish list items yourself, you can help an animal welfare organization continue their lifesaving work. Spread the word about a local shelter or rescue in your community. Find and “like” a nearby rescue organization’s Facebook page or recommend it to as many of your Facebook friends as possible. Share posts or tweets promoting adoptable animals and shelter events in your community. Looking for a low-tech way to promote a shelter this week? Stop by the facility’s front desk and ask if they’d like help distributing or hanging flyers around town. And don’t underestimate the effectiveness of word-of-mouth recommendations; if you know someone who is looking for a new pet to love, talk up your local animal rescue organizations to urge that person to adopt rather than shop for their next best friend. Remember, the more people who know about the organization, the more likely it is for that organization to recruit new volunteers, collect more donations, find quality adopters, and save more homeless pets. Do your part in making sure your pet doesn’t end up in one of their kennels. This week, make an appointment at your trusted veterinarian to have your dogs, cats, and critters spayed and neutered if they have not been fixed already. This surgical sterilization procedure helps cut down on the number of unwanted pets and has plenty of health and behavioral benefits, too. While you’re at the vet’s office, ask the doc to microchip your pet. By having this tiny chip implanted under your pet’s skin and keeping your contact information current with the microchip company, you can make it quick and easy for your local shelter to contact you in the event your pet gets loose and ends up at their intake kennels. For more information about National Animal Shelter and Rescue Appreciation Week, or for more ideas about how you can take part, check out the Humane Society of the United States website today.